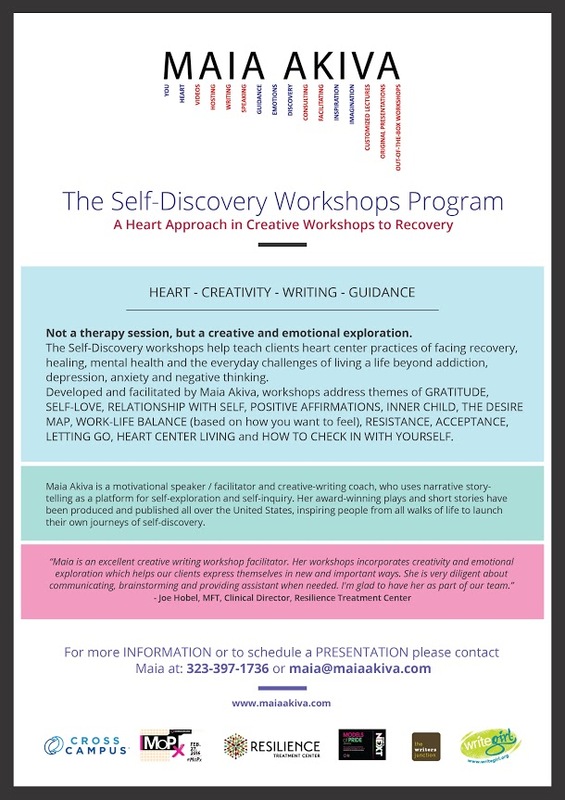 "Maia's workshop helps ease those who have never intentionally explored self-love into the world of self-love. 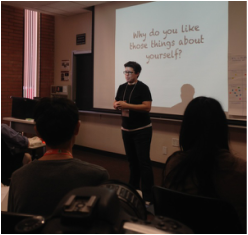 She makes a point to take the self-love work beyond the surface and challenges participants to engage in dialogue with the parts of themselves they both cherish and those they dislike. Maia's attitude throughout the workshop displays a level of affection and caring for her participants that was greatly refreshing. 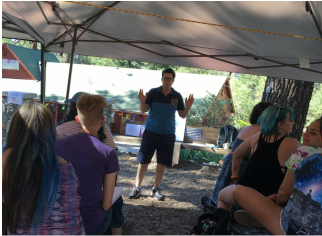 It was wonderful having Maia do several workshops at Models of Pride and MoPx at LifeWorks which is a program of the Los Angeles LGBT Center. 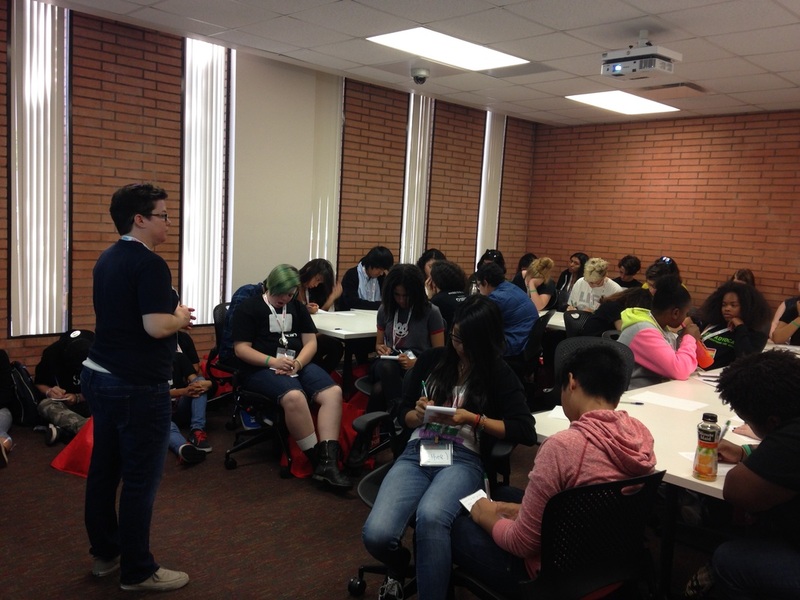 There is always a waiting list for her workshops and the youth really love her"
"Maia Akiva is an inspiring and engaging writer, workshop developer and leader. Maia's dedication to youth work, her quick and inclusive wit as an event host, and her provocative theater pieces all speak to her versatility. She is among my favorite writers and favorite people." "Maia Akiva "Self-Discovery" groups at Reconnect Center are by far our clients ' favorite group. They love it and look forward to Maia coming in every week. Maia creative prompts are original and fun to experience. They help the clients explore themselves and their creative sides in a safe and supportive environment. Maia is very reliable and easy to work with. She communicates very well and is very flexible when things change. We love having her as part of the team in Reconnect Center. The workshops that she facilitates are a great addition to the recovery and healing journey of the clients at Reconnect." "Maia's warm and genuine style - both on the stage and off - is endearing and inspirational. I've had the opportunity to work with Maia at WriteGirl, a non-profit mentoring organization for Los Angeles teens. Maia never fails to create breakthrough activities. She has delivered workshops for as many as 100 attendees, and she's been an MC and co-MC for several WriteGirl events, including our annual Gala performance held at the Writer's Guild in Beverly Hills." "Maia has this way of getting to the heart of what really causes blocks. I had the privilege of taking her workshop at The Junction, and it was incredibly powerful and inspiring to witness her working one-on-one with each person and helping them dig deep. In just a few hours, I learned so much about myself, how I really feel, what I need to work on, and how to deal with and channel my feelings so that I can get back to actually doing what I love doing most. Taking a workshop with Maia is a truly life-changing opportunity that you need to experience for yourself. Thanks so much, Maia!"